During my earlier years as a postdoc at MIT, and as a junior faculty member at Stanford, I had developed a heuristic in carrying out research. I would look at how everyone else was tackling a certain problem and find the core central thing that they all agreed on so much that they never talked about it. Then I would negate the central implicit belief and see where it led. This often turned out to be quite useful. For a year or so I worked with Tomas Lozano-Perez on algorithms to find collision-free paths of industrial robot arms as they moved through a cluttered work space to minipulate parts, or weld, or spray-paint. I realized that everyone who was working on these algorithms was concentrating on how the obstacles in real space appeared as obstacles in a higher-dimensional mathematical space of motor control -- everyone concentrated on how to represent these higher-dimensional obstacles. I decided that instead of representing where the stuff was, I would try representing where the stuff wasn't. In my algorithms there was to be a representation of where it was safe to move the robot arm, and within those constraints they would try to plan a path to get the desired job done. This turned out to provide an immediate payoff and led to some practical algorithms where none had existed before. (via Tom Carden, thanks!). Which sounds like Richard Feynman's approach too. 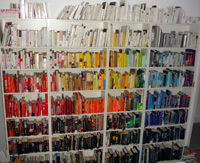 Here we're starting to sort a thousand books by colour, with hue on the horizontal axis (in the traditional rainbow order), and lightness on the vertical. This is a more arbitrary schema than Matt Webb's neuro-landmarking, but it works reasonably well if you're the kind of person who remembers what things look like rather than their exact names. Some are deliberately mis-sorted, according to memory (or other) association: Lessing's The Sirian Experiments's pink cover has faded to grey on the spine, but pink is what is in the memory, so pink it is; similarly Affectt Marcel is grey but seems to be green. And Red Mars goes in red, though Dark Fiber isn't low down on the shelves. And books being read at the moment are in a small pile outside the shelving, rather than being in the previous big section Should-read-some-of-these-soon section. There are some problems already. Some books with two strong colours stand out anywhere. Conversely, there's a tendency for a book's distinguishing colour to be camouflaged if it's surrounded by others similarly coloured. A wedge of light grey and silver that doesn't happily sit anywhere in particular; neither do brown books, which fall outside of the two axes somewhat. Over-sized books can forced out of place, or off the shelves entirely. Not having genres is occasionally a pain, but we're still finding books in a minute, so it's mostly working. This re-sort was inspired by both a friend who sorted her CDs by spine colour, and Chris Cobb's There is Nothing Wrong in This Whole Wide World at the Adobe bookshop in 2004-5. I wanted to make something that I didn't think would exist anywhere, and that nobody would ever make, that I couldn't go anywhere in the world and see it. [...] I'm really grateful for the fact that when the bookstore was organized, all of the shelves along the walls are exactly the same. I think there's seven shelves in every unit. So you can estimate the number of books pretty accurately. It's around 20,000 books. Because of how they're positioned, I can map them out and give coordinates for every book. It'll be, like, shelf 3, row 1. Each book will be given its own designation, so that after they're all taken out and rearranged by color, when it comes time to put them back I can just go back to shelf 3, row 1, or whatever, and I'll know exactly where they go.